Last week, Psych got its viewers thinking about Clue. And then Clue got me thinking about William Castle‘s House on Haunted Hill. Made in 1959, House on Haunted Hill is arguably a template for Clue. On one of horror’s familiar “dark and stormy” nights, a handful of strangers arrive at a reputedly haunted house, a place where seven people have been murdered, 4 men and 3 women—the same make-up as the guest list. The party’s theme centers on a dare: those guests who make it through the night locked up the house with no electricity and no way to call for help will walk away with $10,000. Is this movie high concept? No. It is an enjoyable trip back to the time of cheaply made exploitation double features that aimed to make you jump in your seat at least once? Absolutely. It is also out of copyright and available free in a variety of spots on the web. 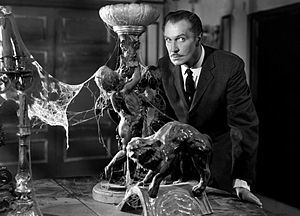 The movie is endearing for many reasons, not the least of which is the always equal parts creepy and campy Vincent Price as the party’s host. The cast also features prolific character actor Elisha Cook (think Sydney Greenstreet’s button man from The Maltese Falcon) over-acting as the charming, wild-eyed Mr. Pritchard, our guide to the house’s dead-body littered history. … which turned out to be a skeleton dropping from the ceiling during showings. Emergo maybe be hard to approximate for home-viewing, but the rest of the original fun is ready for streaming. I got so scared in the theater watching a remake of the House on Haunted HIll that I had to leave.